The Cedar Foundation’s calendar this year has definitely been a busy one! 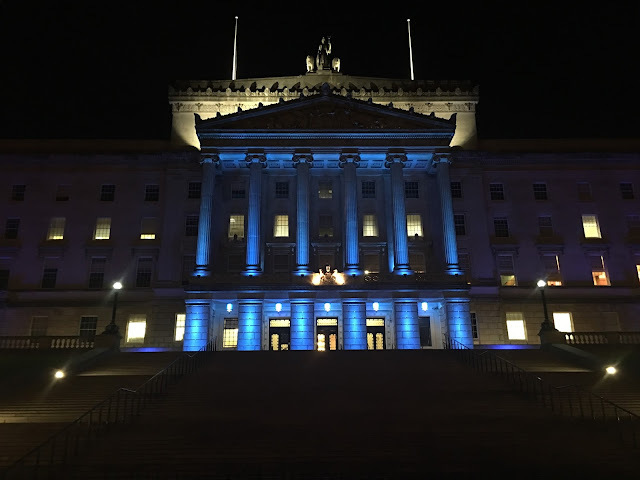 Becoming the Northern Ireland Assembly staff charity of the year back in October, the charity has also been spending the past 10 months celebrating its 75th anniversary. To celebrate this special milestone, and to raise awareness of the charity, Parliament Buildings has been lit blue for the past two evenings. Special lighting effects on the building have transformed the iconic white Portland stone into the corporate colours of the Cedar Foundation. The Cedar Foundation develops and delivers a range of services throughout Northern Ireland to enable people with disabilities to get the most out of life and be fully included in their communities. The charity’s services are designed around individual needs of each person, supporting children and adults with disabilities to participate in all aspects of community life. Assembly staff are organising a range of activities over the next year to raise money for Cedar, and to increase awareness of the issues affecting those with disabilities.